Dr. Ananth Pai completed his M.S from Kasturba Medical College, Manipal, India. He completed his Fellowship of the Royal College of Surgeons (FRCS) from The Royal College of Physicians and Surgeons, Glasgow, UK in 2016. Furthermore he completed his Fellowship in Minimal Access Surgery (FMAS) from the World Laparoscopic Hospital, New Delhi, India and his Fellow of the International College of Surgeons (FICS) from the United States and International Fellowship in Breast Surgery from Germany. Besides this Dr Pai has several international publications, articles and scientific presentations to his credit. He has an impressive track record of over 20 years performing varieties of general and laparoscopic surgeries. Dr Pai has performed over 2000 surgeries for hernia repair, vascular, endocrine, gastrointestinal disorders, pancreatic, perianal and laparoscopic procedures. 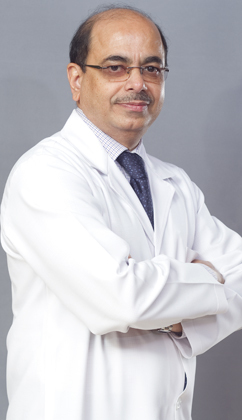 Dr. Pai has worked as specialist surgeon in many prestigious hospitals in the Middle East and India, including Madinat Zayed Hospital and Delma Hospital in Abu Dhabi, Armed Force Hospital in Oman and Kasturba Hospital, Manipal in India. With vast experience in general and laparoscopic surgery, his particular area of interest is in laparoscopic hernia surgery, gastrointestinal and breast surgeries.